Being a former New Mexican, I never would have thought of using potatoes for Enchilada Filling, but I was so wrong! With the addition of mushrooms, and a little dab of Tofu Sour Cream on top these potato enchiladas are the BOMB! Oh my gosh – and the sauce…… Who knew homemade enchilada sauce could be so easy and tasty. When my daughter and wife go back for seconds, you know it’s good. Many thanks to the folks at Forks Over Knives and The Starch Solution for this amazing recipe. Start by making this amazingly easy Enchilada Sauce. One taste of this and you’ll wonder why you ever bought that canned stuff in the stores. Whisk this all together in a small saucepan and slowly add 1 1/2 cups of cold water. Cook over medium heat, stirring continuously, until it thickens. This sour cream is 100% Dairy-Free. If you’ve never experimented with Tofu – don’t be afraid to give this a try. You’ll be amazed how close this comes to the real thing. Start with 1 Tablespoon of each liquid and add more, one by one, until you get the taste and consistency you like. 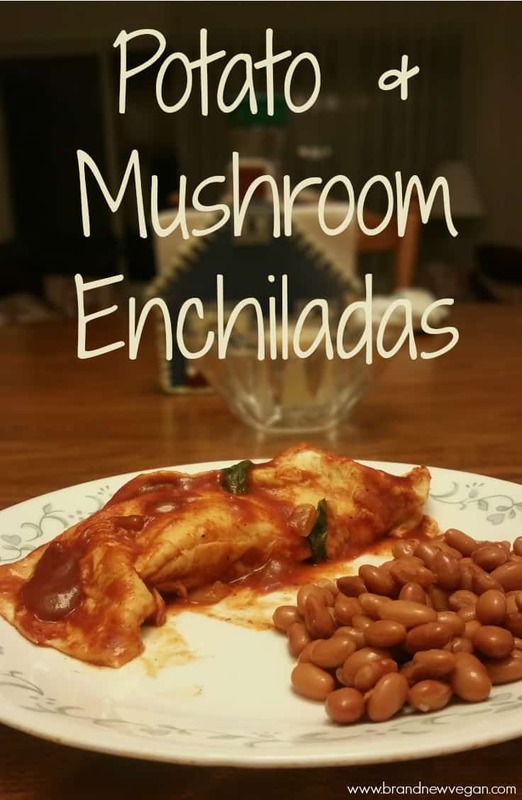 These Potato and Mushroom Enchiladas are amazing. Being a former New Mexican, I never would have thought of using potatoes for filling, but I was so wrong! Boil potatoes in enough water to cover for 5 minutes, drain. These were the bomb! Wow, great recipe! Thanks for posting it! 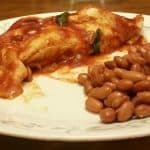 It says to cover with remaining sauce but I do not see where you use it in recipe except at end? I put half the sauce in with the potato mixture then covered with the rest. Will double sauce next time. This was good eating! Thank you for this recipe! Thanks also for making it so easy to print the recipe. Diane, the print button issue has been fixed. I just now saw this comment so sorry in replying so late . I love this sauce but thicken it with masa flour.